Hole in Montreal or Quebec City? Inform me about the next events for Hole. Enroll yourself to our priority waiting list for Hole to be alerted when new tickets are available. Filling this form doesn't engage you to any purchase. Hole is back and wil be performing at the Ottawa Bluesfest on July 9th, 2010. Widow of grunge legend Kurt Cobain, Courtney Love was said to be preparing a solo record entitled "Nobody's Daughter", which turned out to be released under the Hole moniker in late April of 2010. 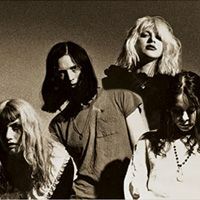 Original members Eric Erlandson and Melissa Auf der Maur aren't with the band anymore, but Love coaxed young guitarist Micko Larkin, bassist Shawn Dailey and drummer Stuart Fisher to join the band. Hole officially split up in 2002, 4 years after the release of Celebrity Skin. In over 10 years, Hole launched 3 albums (including the grunge classic Live Through This) which collectively moved over 8 million copies.